Many of you will soon be setting your New Year’s Resolutions. But did you know that only 8% of people are always successful in achieving the desired results. 92% fail! But all is not lost. There is a better way. 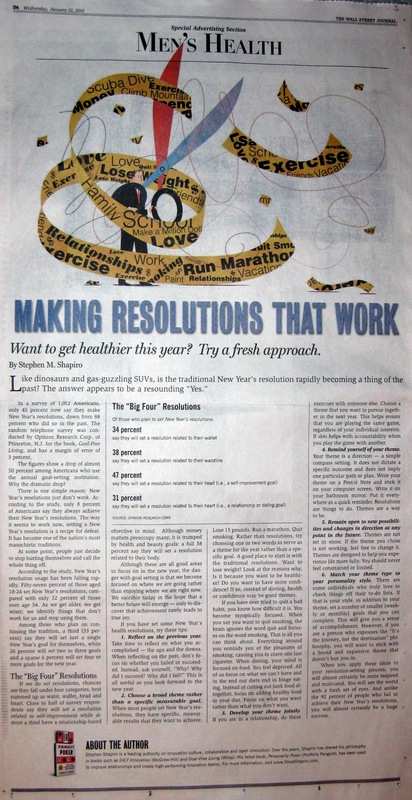 Here is an article a wrote a while ago, but is timeless: Making Resolutions That Work. It remains one of my most often cited articles. These themes get me excited about the New Year. They also make activities that might have seemed tedious, more enjoyable. My theme for 2016: Nothing New! Learn more about this and how it can be a powerful tool for innovation. Posted in blog, Goal-Free Living by Stephen Shapiro on Posted on December 26, 2015 , updated on April 1, 2016 by Stephen Shapiro.